Editors' Note: There are three maps associated with this press release. 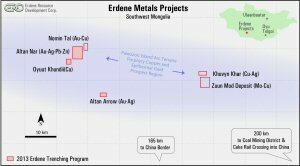 Erdene Resource Development Corp. (TSX:ERD) ("Erdene" or the "Company"), is pleased to report significant gold and silver results from the second phase of trenching that was completed during the fourth quarter at the Company's 100% owned Altan Nar gold-polymetallic project in southwest Mongolia. Results have been received for an additional 11 of the 28 trenches completed (results from the first four trenches at the Discovery Zone were reported November 18th, see release "Three Trenches Over 250 Metre Strike Return Greater Than 1 g/t Gold Over Widths of 44 to 50 Metres"). The trenching program was designed to test ten distinct mineralized zones across the 5.5 kilometre ("km") long Altan Nar target area. Samples from the final thirteen trenches over the central Altan Nar prospect area have been submitted to SGS laboratories with results anticipated during first quarter 2014. 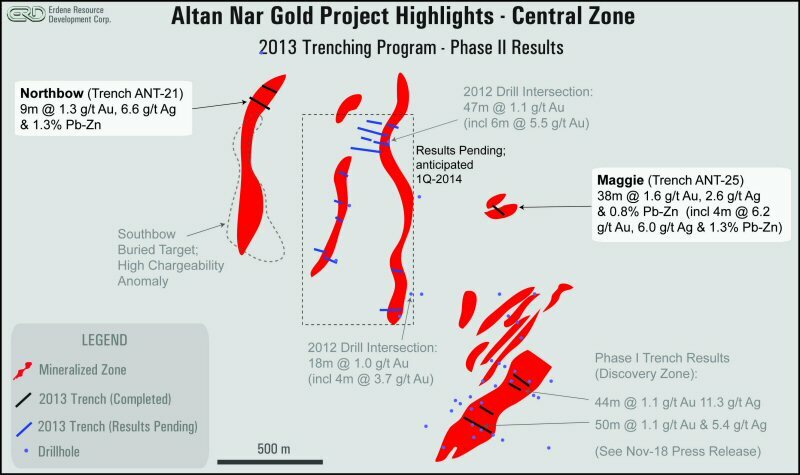 This second phase of trench results tested six distinct prospects within the 5.5km long Altan Nar target area. Only two of these prospects had been previously tested, each by a single shallow drill hole (True North and Northfield). Significant discoveries were made at the Maggie, Northbow, Northwest, Northfield and Far South prospects while trenching at True North confirmed mineralization observed in previous drilling. The following section and enclosed maps provide additional details on the results. Located one kilometer north of the Discovery Zone and 700m east of the Union North prospect (47m of 1.3 g/t in drillhole TND-46), Maggie is characterized by shallow cover, anomalous geochemical results and a magnetic low feature. Trenching uncovered a well mineralized zone, 38m wide and hosted by an altered andesite cut by two barren post-mineral dykes (7m and 2m wide). The mineralized zone is characterized by black quartz veins and breccia with strong to intense sericite alteration with abundant iron and manganese oxide. Excluding the 9m of post mineralization dyke, the central mineralized zone returned 17m of 3.4 g/t gold, 4.9 g/t silver and 1.41% combined lead-zinc. The magnetic low feature, a common characteristic of Altan Nar mineralized zones, intensifies north of the trench and may represent an area of intensifying alteration. The Northbow trenches targeted anomalous geochemistry associated with a previously untested, north-south trending, strong gradient-IP chargeability anomaly. Similar gradient IP anomalies are commonly associated with gold-bearing sulfide mineralization at Altan Nar. The IP anomaly at Northbow extends 700m south where it widens and intensifies. This area, known as Southbow, is covered by younger sediments making detection of geochemical anomalies more difficult. Northbow trenches uncovered wide mineralized zones of intense phyllic alteration characterized by significant amounts of finely disseminated pyrite, a common cause of high chargeability anomalism. 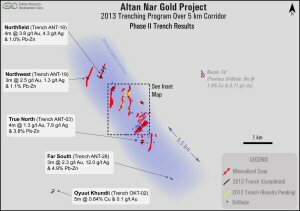 The results from the Northbow trenches are significant in that they are the first confirmation that gold mineralization is associated with the Northbow-Southbow geophysical anomaly, the largest and most intense identified to date on the Altan Nar property. A single trench tested the northwestern-most target area (ANT-19; Northwest prospect) and uncovered strong propylitically altered andesite cut by narrow quartz veins. The zone returned 3m of 2.5 g/t gold and over 1% lead. At Northfield, four trenches (ANT-17, ANT-18, ANT-22, and ANT-23) tested 400m of strike length and uncovered multiple, often broad, zones of phyllic alteration with mineralized stockwork veining and quartz breccia. The broadest zone intersected on the Northfield prospect was 19m of 0.6 g/t gold in trench ANT-17 while the highest grade zone was 3.8 g/t over 4m in trench ANT-18. The True North prospect, located 200m south of the Discovery Zone, returned significant results from one of the two trenches excavated on this prospect. Results from trench ANT-03 returned a 4m zone of 1.3 g/t gold and a high combined lead-zinc content of 3.8%. These results reflect what was intersected in a shallow hole drilled on the True North prospect in 2012 which returned 2m of 2.07 g/t gold, 15.5 g/t silver, and 10.1% lead-zinc. The Far South prospect is located a further 1.5km to the southeast and the single trench (ANT-28) is the only sub-surface work completed to date on this portion of the Altan Nar property. ANT-28 returned 3m of 2.3 g/t gold, 12.0 g/t silver and 4.9% lead-zinc, confirming the widespread nature of the gold-silver-base metal mineralization at Altan Nar. 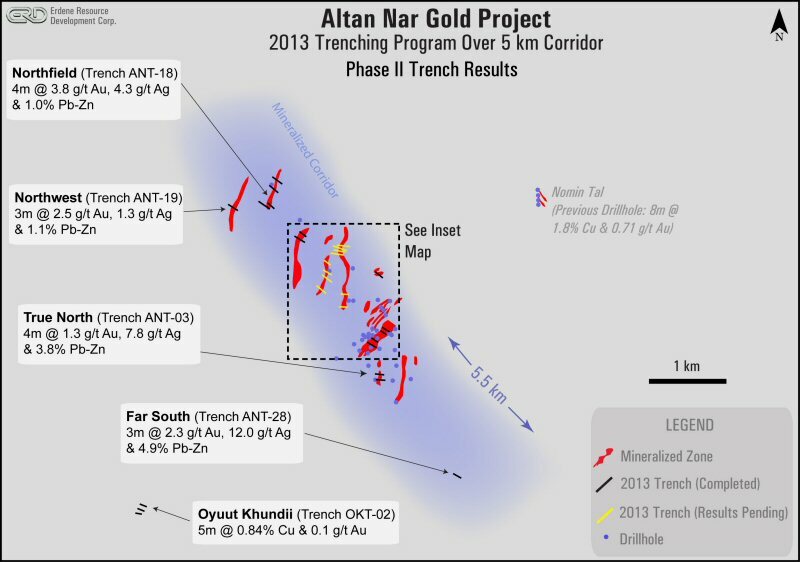 Also located on the Altan Nar licence is the Oyuut Khundi copper prospect. Three trenches were excavated over an 80m strike length at this prospect, located approximately 3km southwest of the Discovery Zone. Two of the trenches reached bedrock and uncovered a 5m to 8m wide zone of quartz veining and phyllic alteration of felsic volcanics with highly anomalous copper and gold, up to 5m of 0.84% copper and 0.1 g/t gold. A large portion of the central Altan Nar property is covered by the following prospects; Union North (previous drilling returned 47m of 1.3 g/t gold), Union South and Riverside. Samples from thirteen trenches excavated across portions of these three prospects are now at the SGS Laboratory in Ulaanbaatar, Mongolia. Final results are anticipated early in the first quarter 2014. These parallel zones, Union (North and South) and Riverside, extend over a combined 2km strike length. The objective of the trenching program is to further define the near-surface mineralization identified to date, improve the understanding of the gold mineralized system and prioritize new areas for the next phase of resource drilling. The exploration data generated by this program will also be used to develop conceptual plans for initial open pit development. These trench results, in conjunction with previous drill results, indicate the presence of a potential shallow, large, bulk-tonnage, gold-silver-lead-zinc mineralized system. The original trenching program, announced in October 2013, was expanded from 1,200m to 1,858m due to the Company's early success in identifying and expanding mineralized zones. The surface expression of the Altan Nar project area is one of low relief with thin Quaternary cover over much of the area, interspersed with low rolling hills. The intense weathering of the altered, sulfide-rich, stockwork breccia zones leaves little surface expression of the targets and little indication of their size other than remnant quartz rubble. As a result, the extent of alteration and mineralization observed in the trenches commonly exceeded that indicated by surface expression. 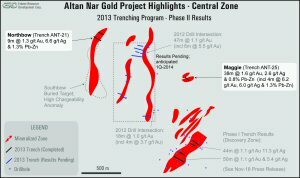 To date, the Altan Nar targets have not been tested below 250m vertical depth, however multiple holes have ended in zones of greater than 1 g/t gold. J.C. (Chris) Cowan, P.Eng. (Ontario), VP Asia for Erdene, is a Qualified Person as that term is defined in National Instrument 43-101 and has reviewed and approved the technical information contained in this news release. All samples have been assayed at SGS Laboratory in Ulaanbaatar, Mongolia. In addition to internal checks by SGS Laboratory, the Company incorporates a QA/QC sample protocol utilizing prepared standards, blanks and duplicates. 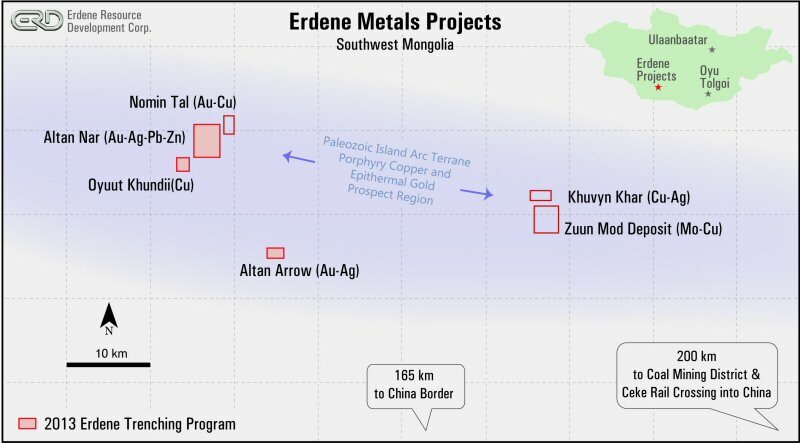 Erdene Resource Development Corp. is a Canada-based resource company focused on the acquisition, exploration, and development of base and precious metals in underexplored and highly prospective Mongolia. For further information on the Company, please visit www.erdene.com. Erdene has 68,621,503 issued and outstanding common shares and a fully diluted position of 80,165,692 common shares. Certain information regarding Erdene contained herein may constitute forward-looking statements within the meaning of applicable securities laws. Forward-looking statements may include estimates, plans, expectations, opinions, forecasts, projections, guidance or other statements that are not statements of fact. Although Erdene believes that the expectations reflected in such forward-looking statements are reasonable, it can give no assurance that such expectations will prove to have been correct. Erdene cautions that actual performance will be affected by a number of factors, most of which are beyond its control, and that future events and results may vary substantially from what Erdene currently foresees. Factors that could cause actual results to differ materially from those in forward-looking statements include market prices, exploitation and exploration results, continued availability of capital and financing and general economic, market or business conditions. The forward-looking statements are expressly qualified in their entirety by this cautionary statement. The information contained herein is stated as of the current date and is subject to change after that date. Erdene does not assume the obligation to revise or update these forward-looking statements, except as may be required under applicable securities laws.